Canadian companies with global e-commerce website designs stand to profit from the 20 million digital buyers expected in Canada alone, by 2018. 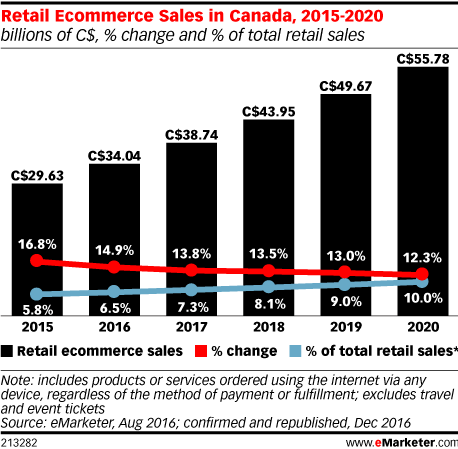 Double digit annual gains are boosting Canada’s e-commerce economy, and if your company does not have an effective, professionally created e-commerce website design, you’ll be left behind in the digital growth of the ecommerce marketplace. Responsiveness is key, with over one third of the Canadian smartphone using population making purchases online. As comfort and trust with smartphone shopping grows, so does the opportunity for Canadian companies to attract their share of the mobile purchasing market. To attract, convert, and keep consumers, Canadian businesses need to have an easy to use on-line store that is very friendly to smartphone users. While there’s plenty of room for growth, the competition will become fierce, and those companies without and ecommerce web design created by professional Canadian website designers will take a hit in their profit margins. Canadian companies not only profit from the national economy, but from the global economy as well. Smartphone purchasing comfort is growing in the global marketplace as well as within Canada. A Canadian company with an effective e-commerce website design that features an easy to use shopping cart can easily pull ahead in profits quicker than its competition. Ninety-three percent of digital shoppers prefer to use credit cards to make their purchases, necessitating a flawlessly created e-commerce website design. Using credit cards on a smaller smartphone screen requires a mobile responsive design in order to make the experience as consumer friendly as possible. While ease of use is one of the most important factors in ecommerce website design, innovation and attractiveness are also prized. Canadian companies need to dazzle their customers with their product photos and creatively showcase their services. When you’re looking for ecommerce web design Canada for your business, turn to the professional Canadian website designers here, at Thought Media. 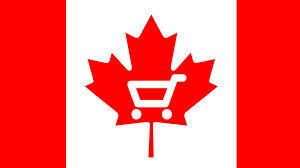 We have extensive experience servicing Canadian companies that use ecommerce to attract customers in the global, as well as local, marketplace. Call 1 (800) 916 3864, or Request Quote for your e-commerce website design.